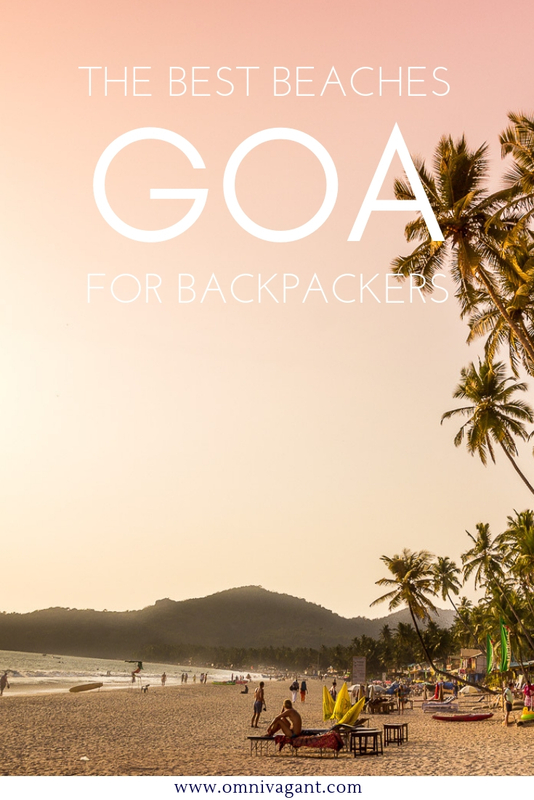 Goa… or well, the Ibiza of India, is a state that should not be left out of your South India itinerary. While India is not known as a party or beach destination at all, Goa is exactly that, a party paradise. So looking for a break from the hectic India life? Maybe perhaps even get a tan or zip cocktails on the beach, Goa is your place to be! However, even though this state is tiny, there is still a large difference between the beaches and areas, so choose wisely where you’ll stay. You will find some beaches filled with the largest and most beautiful resorts, while other beaches, are simply hippie paradise. Every beach has something new and something different to offer, and for that reason it is important to be sure you pick the right beach for you. Goa has a coastline of roughly 160km with over 70 beaches stretching along this coast line. So to help you out we have created a list of the best beaches for backpackers. Don’t expect fancy resorts here, instead expect simple beach shacks and the most beautiful relaxing views. Vagator, located in North Goa, is that perfect place if you are looking for some relaxing time. It is quiet and serene, however, not the best place if you are looking to party. Vagator is separated into three different beaches, you will find most of the backpackers at Ozran beach and the locals at Vagator beach. The last beach, Chapora beach, is a old fisherman style of beach. 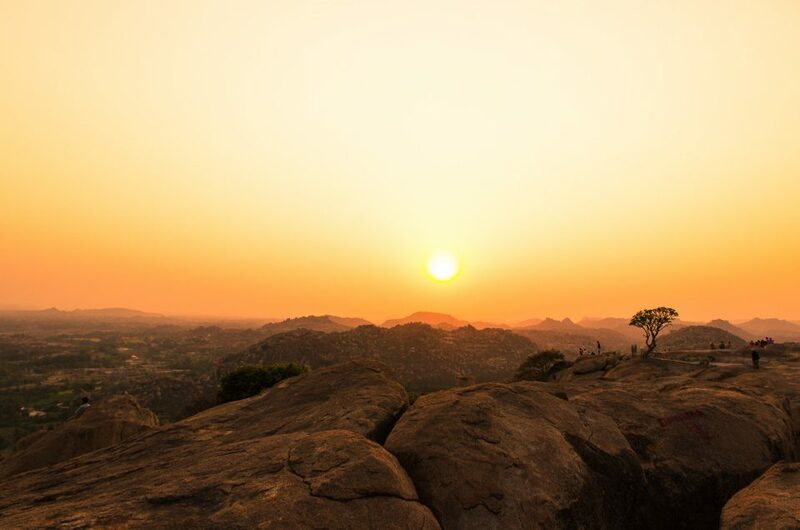 Near the beaches you can find some beautiful viewpoints such as Chapora Fort, which offers great views for sunrises or sunsets. Vagator is the second most Northern beach on this list, and if you are keen on exploring multiple beaches just make your way South from here to the next beach: Anjuna. With Vagator being a popular destination for backpackers it isn’t hard to find a hostel in this area. We visited Vagator on a day trip from Anjuna, but some people might be keen on staying here a bit longer. There are multiple hostels located in the area with some of the most popular hostels on Hostelworld being Dreams Hostel or Jungle by the Hostelcrowd. Almost all hostels in Vagator are located within walking distance to the beach and many restaurants and shops nearby. The Hostelcrowd has multiple hostels located in Goa, with Jungle being one of the most popular ones! Want to see what else is out there, check out all hostels in Goa here on Hostelworld. 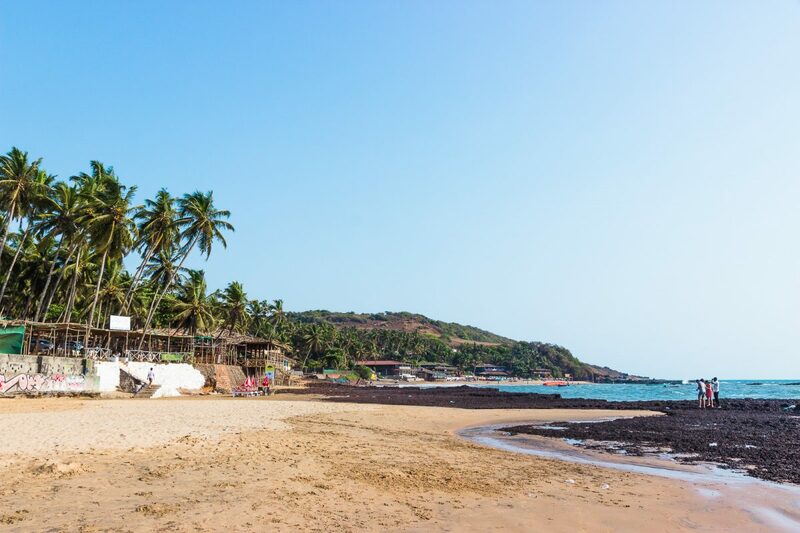 Anjuna Beach is situated in the North of Goa and is basically known as party paradise, a place that is visited by many travelers who are backpacking Goa. You will find this beach to be filled with locals and foreigners ready to party! During the day you can hang out at the beach, get a nice tan, enjoy some amazing food, or even rent a scooter out to explore the area. One of our favorite places must be Tantra, a place that has treehouse-style balconies with a view on the beach. You will only have to look down to the kitchen and they will come take your order, a perfect place for a relax day…. or week. But as soon as the sun sets the beach becomes one big party, so enjoy a cocktail over sunset, and get ready to dance the night away. Anjuna is home to Curlies, the place that is known to be the birthplace of Goa Trance. While it is not exactly my kind of music and perhaps not yours, it is an experience on its own. Besides that, the place to be basically changes every evening with different parties going on, so be sure to check with the hostel staff, as they will most like be up to date about the latest events. Or else you will always be successful finding a party at the beach, and in the end what is better than dancing standing with your feet in the ocean. One of my personal favorite hostels during my time in Goa must be Prison by the Hostelcrowd. In no hostel in India did I have so much fun as in Prison. The name makes it kind of obvious, but the whole place is in prison style, including bars in front of the doors and windows and a sign that says “Clean up after yourself, you’re in prison b*tches”. Beds are comfortable, hostel is clean, staff is friendly and helpful and the place has a great atmosphere. The hostel is a 10 minute walk to the beach and is closely located to many restaurants. Another popular hostel in Anjuna is The Funky Monkey Hostel with only a 5 min walk to the beach if you are looking to stay a bit closer to the beach, or just simply rather not stay in something that resembles a prison! 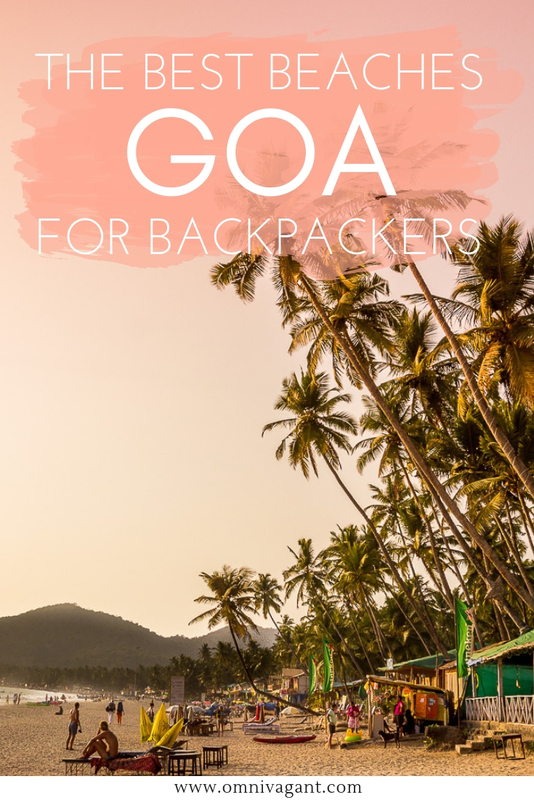 The beaches in Goa are stretched from the North to the South side of the state, and getting from one to the other side might take a couple of hours; so it is smart to think wisely on where you will stay, or which destinations to pick and in which order to visit them. Arambol beach, the most Northern beach on this list, is known as the hippie beach of Goa. It is a beautiful 16km long beach that even has a fresh water lake. It has a nice, quiet and relaxed feeling to it and is filled with other backpackers, mainly situated a bit inland, away from the beach. Arambol has been a popular destination since the 1960’s, when the hippies first arrived in Goa. Looking to stay in Arambol? Arambol is located roughly 17km North of Vagator, so if you are planning on exploring more beaches in North Goa you might want to start in Arambol, make your way to Vagator and end in Anjuna, or vice versa of course. With Arambol being hippie paradise it isn’t hard to find hostels here and while there are multiple hostels, the place to be (at least according to Hostelworld ratings) is Happy Panda Hostel. With over 400 reviews this hostel still has a 9.4/10 on Hostelworld in early 2019 with travelers especially loving the good vibes at this hostel. Read the latest reviews and see the latest photos here on Hostelworld or find all hostels in Goa here on Hostelworld. Palolem, is most likely my favorite place in Goa, and is located in the South of Goa. Palolem is a place I could easily stay for a week, or month, or perhaps even a year. Palolem, to me, had that right mix of party and relaxing and with such stunning views it is one of the most breathtaking places in India to visit. The beach is absolutely beautiful, with little beach huts located all along the beach. Find yourself a nice shack midway the beach and enjoy a morning swim before having a breakfast with ocean view. 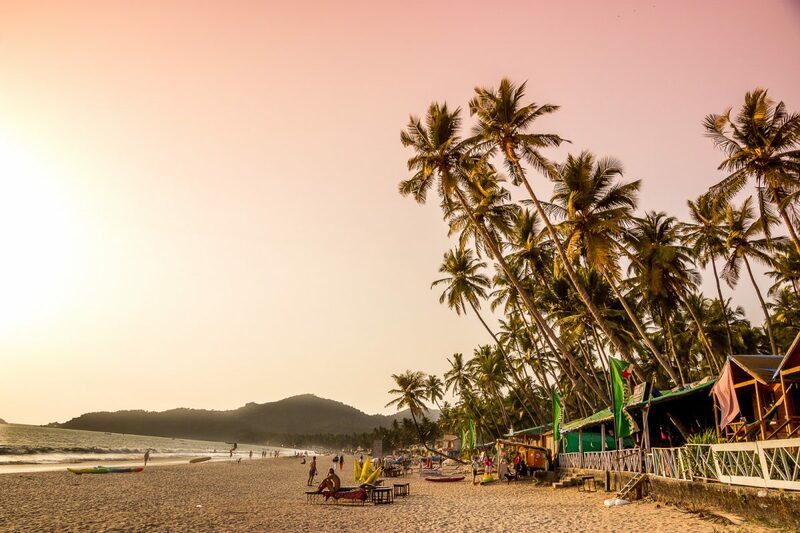 Palolem is home to many fantastic restaurants for good food, places to see live music at night, or even a silent disco that allows you to party, but not disturb the serenity of the area. Just like Anjuna, Palolem is one of the most well visited beaches in Goa, if you are looking for more offbeat places in Goa this is not the place for you! From Palolem you can rent a motorbike and explore national parks in the area, or some of the other lush beaches this area has to offer. Just don’t forget, you are here to relax, so grab that cocktail and curry and see the sun set over the ocean. Some of our favorite places in Palolem for food are: Avocado Garden, and Little World (which has the tastiest chai and pancakes) which are both great if you are looking for a non local breakfast. For drinks, Club Havana makes these tasty (and cheap) Gin & Tonics, and they have comfortable bean bags with an amazing ocean view, a perfect place to see the sun set. Looking for some awesome locals cooking the tastiest thali? Find Maria and Michael on Ourem road, food is tasty and this couple are just the sweetest! If you are a solo traveler looking to meet some people, you might want to look into staying at Summer, another hostel from the hostel crowd! The hostel is clean, offers free breakfast, is a good place to meet new people and is not too far located from the beach. 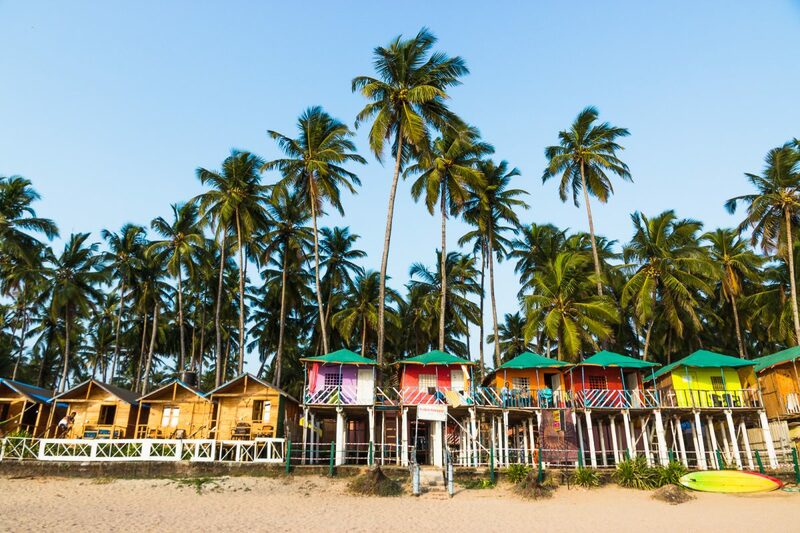 However… if you want the real Palolem experience, go over to the beach, take a walk over the beach and ask around how much the beach huts are. The budget beach huts (400 – 600 Rupees, suitable for 2 people) are very basic, and often don’t offer an ocean view, but well, you are going to be hanging out on the beach anyway right? The luxury beach huts can be as expensive as 1500 to 3000 rupees, suitable for those with a higher budget. Nine km North of Palolem, but still located in the South of Goa, you can find the smaller and the peaceful beach of Agonda. Perfect if you are in the South and want to escape from the bigger tourist crowds, or large groups of backpackers. The views on Agonda beach are pretty amazing, get yourself a nice shack on the beach, or close to the beach, and enjoy the ultimate beach life. When we visited Agonda in early 2017 nightlife seemed to be pretty nonexistent in Agonda, so this is more a beach to enjoy the serenity and tranquility of Goa. If you are looking for a party you might find yourself a little bit more home in Anjuna in the North of Goa! Simply sunbathe on the beach, perhaps even with some cows as seen below, and work on getting that perfect tan. There are less hostels located in Agonda, it is more of a beach shack kind of place. The easiest way to find a place that you like is by walking along the beach and inquiring prices, as almost none of the beach shacks here have there accommodation available online. However, if you prefer to book something in advance, to be sure you have a place to stay check out Booking.com here. One of the most popular places to stay on Booking .com for budget backpackers seems to be Saturn Cottages, to see if this is the place for you check the latest reviews, photos and info on Saturn Cottages here. Cola Beach is a very quiet and deserted beach located riding distance from Palolem beach. Unless you are looking for absolute quiet and tranquility, we would personally not recommend staying here due to its remote location. 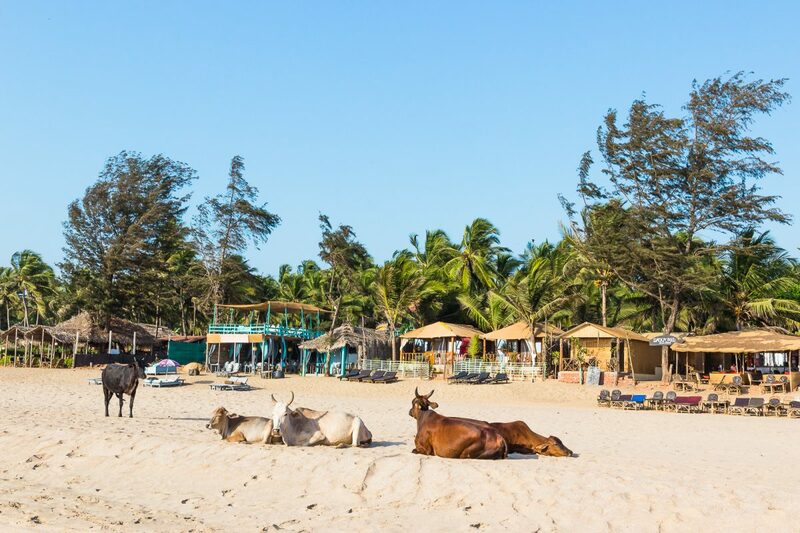 We would personally recommend staying at Palolem Beach, where there are more options for restaurants and shops, and just go to Cola Beach on a day trip! 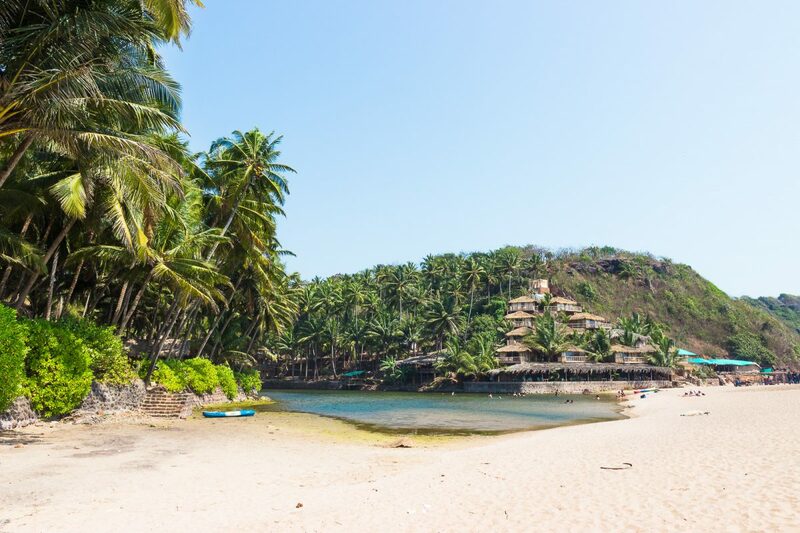 Cola Beach is located North of Palolem and Agonda, and is roughly a 30 – 40 min ride from Palolem, not taking into account the last part of the trip. You can easily ride there by scooter, albeit it a very very very bumpy ride though for the last part of the road. But honestly, bumpy or not, the ride was worth the view, and the experience of visiting one of the more remote and quiet beaches of Goa. And there you have it, 6 of the best beaches for backpackers, especially those on a budget. Which beach you choose really depends on what you are looking for when it comes to the beaches in Goa. When it comes to a party I would definitely recommend Anjuna, as this is the place for partying in Goa. 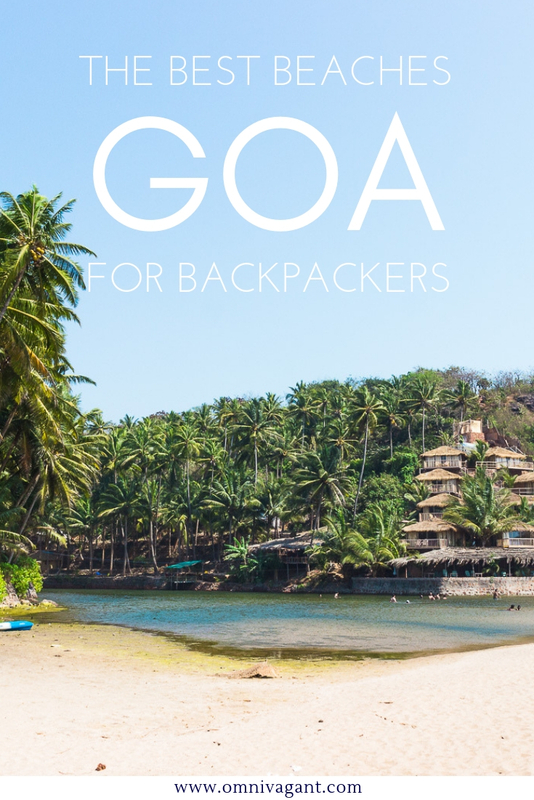 If you are a backpacker on a budget you might want to try to stay away from Baga, Calangute and Candolim. These are Goa’s most famous beaches when it comes to all inclusive deals and resorts. In the end, no matter which beach you’ll pick, move around a bit and you’ll find a beach that suits just you! Transparency: Some links on this page are affiliate links. This means that buying a product via these links, at no additional costs to you, earns me a small commission; these small commission are what keeps this website going. I, nonetheless, only recommend products I personally use and believe in!